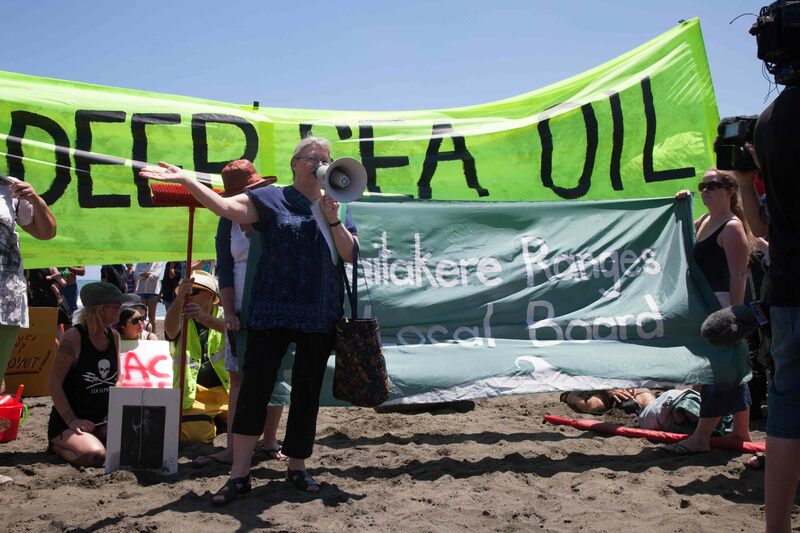 Last weekend there were a series of spirited protests on West Coast beaches by people who are deeply concerned at the prospect that oil rigs could be drilled within 6 nautical miles of the local sea shore. All Waitakere Ranges local board members were at the protests except Denise Yates who was ill but with us in spirit. Sandra Coney, Saffron Toms and myself were at Piha and Steve Tollestrup and Neil Henderson were at Bethells Te Henga. 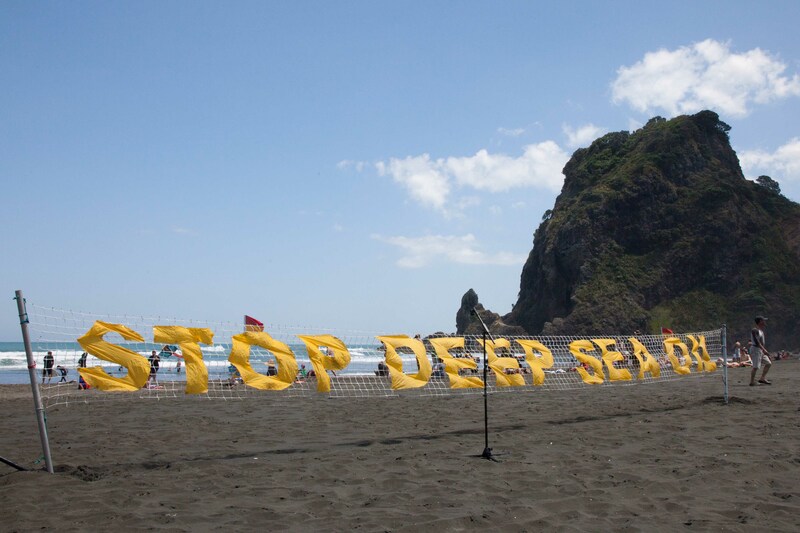 Such was the upset caused by the proposal there were also protests at Karekare, Whatipu and even Huia. The depth of opposition to the proposal was clear to see from the significant numbers who turned up to each of the beaches. I blogged about the issue previously. The Government has proposed issuing permits for the exploration of oil as close as 6 nautical miles out from the West Coast of the Waitakere Ranges. The consultation by the Government with local authorities has been less than stellar. The consultation was announced on September 24 during the height of the recent local elections and a response was expected by November 14, before any of the local boards were fully functioning. To make things worse there is a proposal law change so that permits be issued on a non notified basis. If this passes the public will not have a say on whether permits should be issued. Auckland Council has prepared and lodged a submission. It makes the valid point that the proposed areas includes the habitat of the endangered Maui’s Dolphin and proposes that this is shifted out to 12 nautical miles, although with the potential of spills being pushed inshore you have to wonder if this is far enough out. It also proposes that exploration activities adhere to DOC guidelines for minimising acoustic disturbance to marine mammals, including within 20 nautical miles of the Marine Mammal Sanctuary, and that action should be taken to ensure that risks of oil spills and other discharges are minimised, particularly in areas close to the coast. But it is essentially supported the issuing of permits or at least did not oppose. Unfortunately the local board, despite its keen interest in the protection of the West Coast beaches and despite its duty to advocate for the interests of local residents was not asked what its views were. Because if it had then we would have had plenty to say. If asked we would have said basically that the West Coast is a taonga for the people of Auckland, that its scenic beauty should not be despoiled by oil rigs, that its waters are hugely important for marine life especially Maui’s dolphin and that nothing should be done to threaten this. We would have said the West Coast marine environment and coast has the greatest level of protection the Auckland Council can give it in its planning document – even the surf breaks are protected. The whole coast is also protected by national legislation, the only land area in New Zealand protected like this. For over a century, the people of Auckland have built up a vast conservation park, now 17,000 hectares. We would have said that this is Auckland’s highly valued playground. And that this is put at risk by oil drilling off the coast. We would have said that we were not convinced that deep sea oil drilling was safe and that the claims that the legislation was “fit for purpose” and “world leading” were just verbal flourishes that added nothing to an appraisal of the safety of drilling. We would have said that the drill ship’s on board emergency rescue kit was a joke and that the country’s oil spill response equipment and the oil recovery vessels owned by Maritime New Zealand were hopelessly inadequate for any reasonably sized oil spill. And finally we would have said that with the inevitable march of climate change our world needs to decide to leave some oil in the earth and that the best oil to leave was that located into dangerous places where the slightest mishap could cause havoc to some of the most beautiful places in the country.